A number of residents of Raleigh’s Historic Oakwood neighborhood were not happy to find their cars were missing from the street Saturday morning. The Color Run, a for-profit road run featuring dyed corn starch packets, had set up for its run through the neighborhood. Unlike most road races, organizers insisted that all the cars be removed from the street, most likely because of the colossal mess the corn starch packets make. Raleigh Police posted “no parking” notices with as little as 13 hours notice, leaving many residents unprepared. Tow trucks hauled off their cars and stuck them with bills upwards of $150 to get them back. This in addition to the godawfully sticky corn starch that trashed their streets and homes. Needless to say, residents were livid at their cars being taken and their neighborhood trashed. Council members were summoned and the city has agreed to reimburse residents for their towing charges. I watched after the run as contractors worked to clear the starchy muck off of Wilmington Street near Polk Street. The contractor used a bleach mixture for this work, pouring this chemical-laden broth into our storm drains for eventual draining into the Neuse River. Nice move. I made a call to the city’s stormwater department when I saw this and begged someone to check it out. The city responded that this was just one of many issues they are collecting about the run. Several runners question the motives of a for-profit company closing down city streets and using city resources. I watched at the end as a decal-laden Color Run car was loaded onto a tractor trailer that already held about 8 other shiny company vehicles. Apparently business is good! Activate Good, a nonprofit volunteer center that connects volunteers to over 150 charities in the Triangle, has been chosen as the charity partner for The Color Run in Raleigh on September 28 and we need LOTS of volunteers! Volunteers will work as “captains of fun” helping man check-in and points along the race, help with clean-up, or – the messiest job – work as “color zone” volunteers, throwing powdered color at racers as they pass through each color station! Is The Color Run™ a charity or a non-profit organization? The Color Run™ is not a charity or non-profit organization. The Color Run, LLC is a “for profit” event company. Yes, we do. The Global Poverty Project, the non-profit behind Global Citizen, is The Color Run’s global charity partner. This partnership will give Color Runners the opportunity to engage in global issues, make an impact in the world and be proactive in ending extreme poverty. 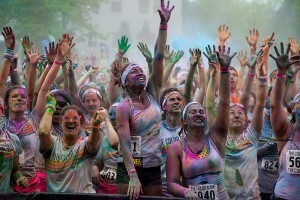 On GlobalCitizen.org, Color Runners can take actions for charities and enter to win rewards such as tickets to live concerts in their hometown, while improving the state of the world. For more information on this partnership, click here. The Color Run also works with local organizations in various cities they host events in. The Color Run’s number one goal, as it relates to local charities, is to increase cause awareness. We want to help shine a light on important issues. We hope our Color Runners will spend time on the website of our partner charities, join mailing lists, attend other events hosted by the charity and become an advocate for these causes. We give our charity partners a microphone to speak to thousands of good hearted people. We thank you, Color Runners, for listening. Anchorage’s charity, the Boys & Girls Club, supplied 250 volunteers who each worked 5-6 hours on race day, and 20 people to run the booths for several hours during each of the four bib pick-up times. The charity will receive a set donation amount based on the number of volunteers it was able to provide for the event. With 15,000 participants paying $40-$50 to race in the Color Run — does the race’s contribution of $5,000-$10,000 for 200 volunteers’ work measure up? Few reports of The Color Run’s charitable contributions exist online, but a local report from Des Moines, Iowa’s 2012 Color Run stated that with 30,000 attendees, the event grossed $1 million, and gave $28,000 to the partnered non-profit, Variety, The Children’s Charity. Admission to Color Run events typically ranges between $35 and $55 per person, according to Nixon. For Sacramento, the fee is $40, and $55 for last-minute registrations. The event is marketed largely through social media, Duncan said. Based on those figures, Saturday’s race brought in more than $500,000. Its charity partner, Girls on the Run, expects to net up to $14,000, said Amanda Holliday, the nonprofit’s board president. In both cases that’s a measly 2.8% of the revenue. They might call it a run, but it smacks of someone being taken for a ride. Update Wednesday 9:41 PM: Activate Good responds. FYI – Soup contains many “chemicals” (oxidane, sodium chloride, …) and is sometimes call “broth”.